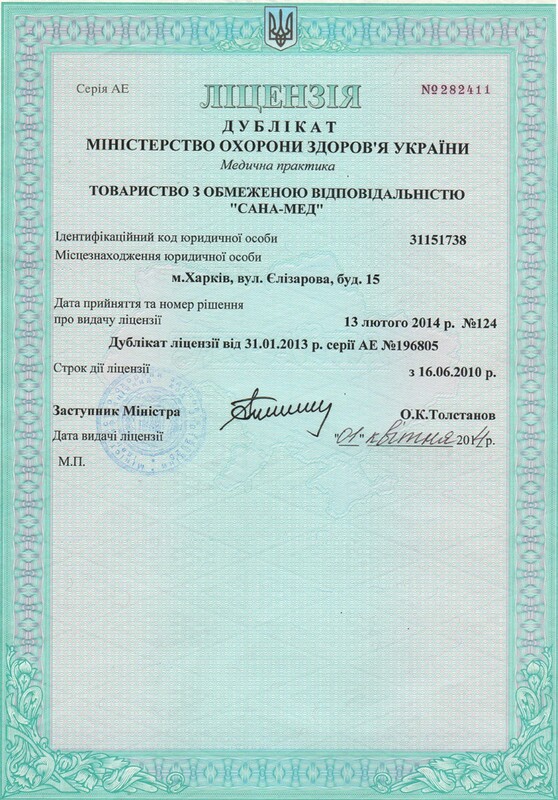 Center for Human Reproduction Clinic of Professor Feskova A. M. provides medical services in accordance with the license of Ministry of Health of Ukraine AE №282411 of 13.02.2014. In its work the clinic is guided by the legislation of Ukraine, the current orders and industry standards of the Ministry of Health of Ukraine, the standards of the European Association of Reproductive Medicine (ESHRE). 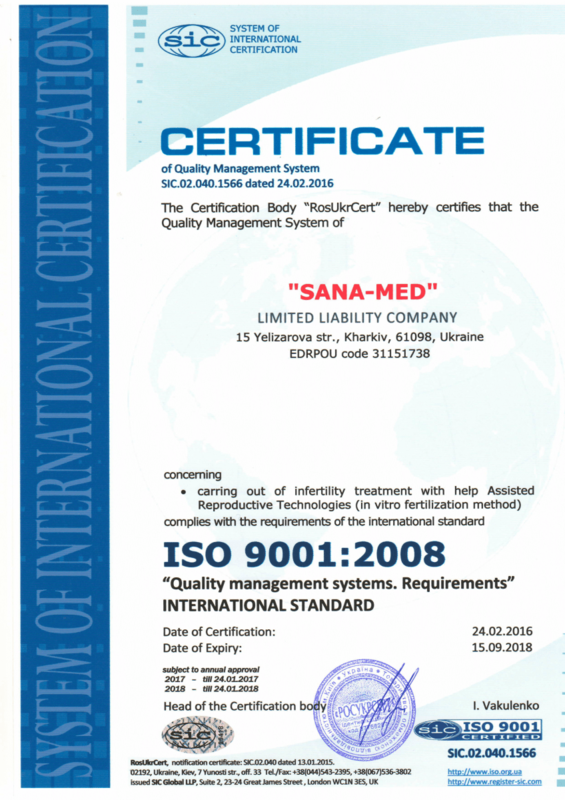 The clinic is certified according to the ISO9001 system and accredited by the Ministry of Health of Ukraine. Method of stabilized reproduction for treatment of reduced fertility women with irregularity of the immune reaction. And also by the patent of Ukraine for invention. 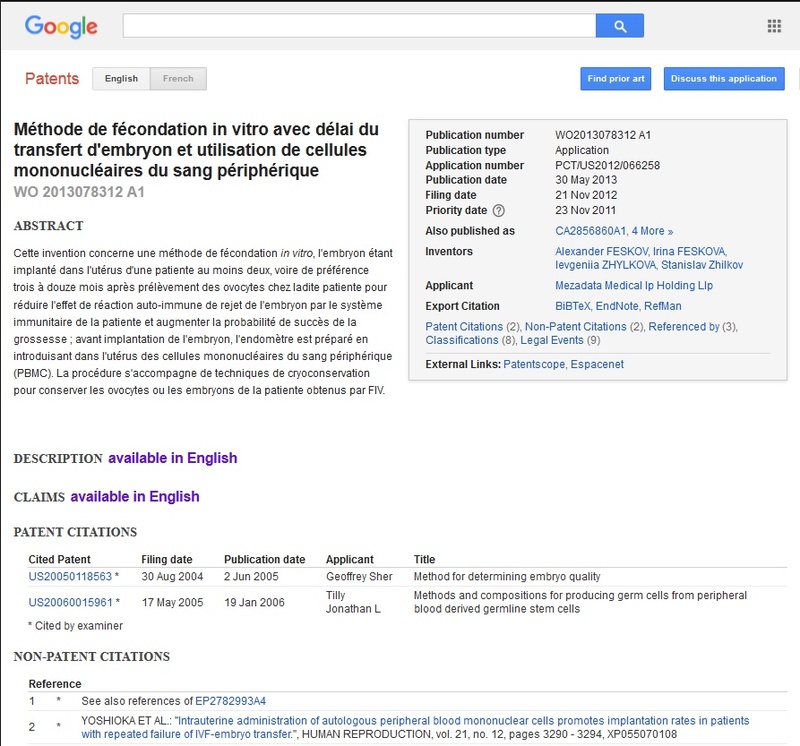 The essence of the invention: New perfect methods of infertility treatment of various origin are presented. 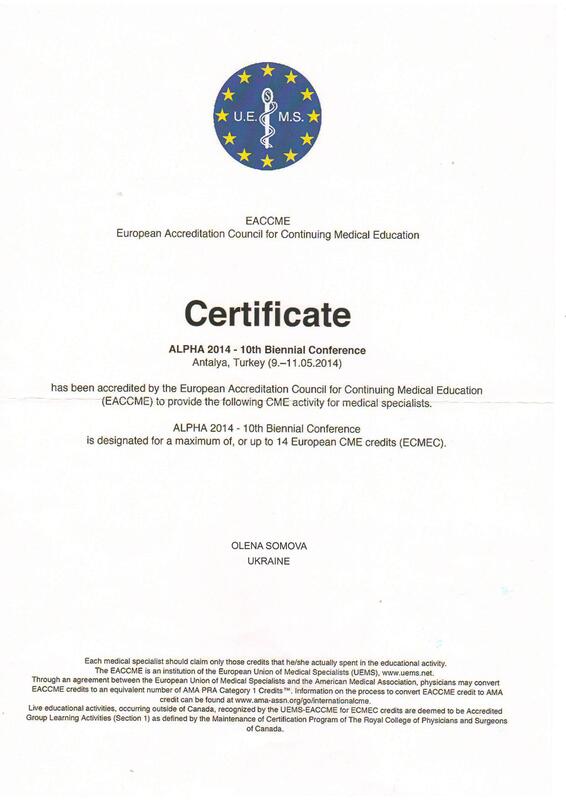 The clinic has a US patent: Method of in vitro fertilization with delay of embryo transfer and use of peripheral blood mononuclear cells"
European Accreditation Council for Continuing Medical Education Cartificate ALPHA 2014 - 10th Blenial Conference. Olena Somova from limited liability company “Sana-Med” Has been accredited in Antalya Turkey. Kharkiv Regional State Administration presents this Certificate of Recognition to Alexander Feskov, Director of “Center of Professor A.M.Feskov” for many years diligent work, consummate professionalism, noticeable personal contribution to health protection and reproductive medicine, social activism and more. 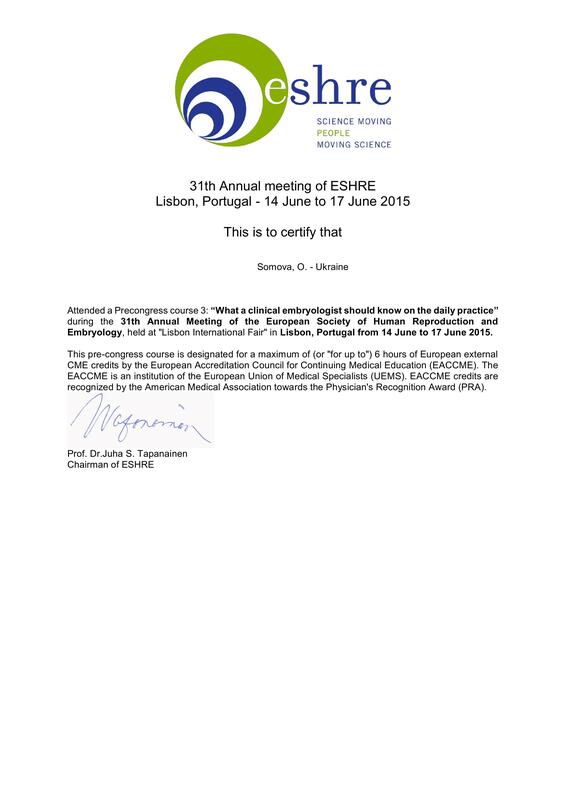 31th Annual meeting of ESHRE in Lisbon Portugal - 14-17 June 2017. 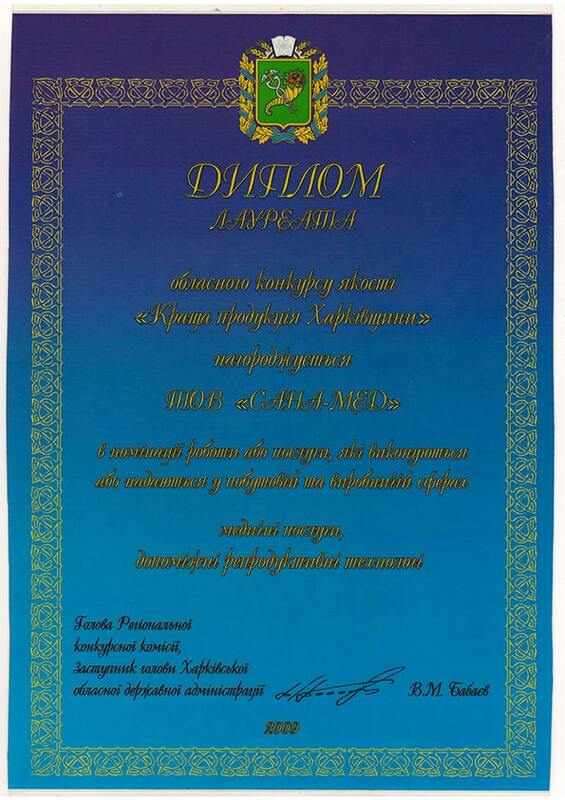 Olena Somova from limited liability company "Sana-Med" has been awarded. 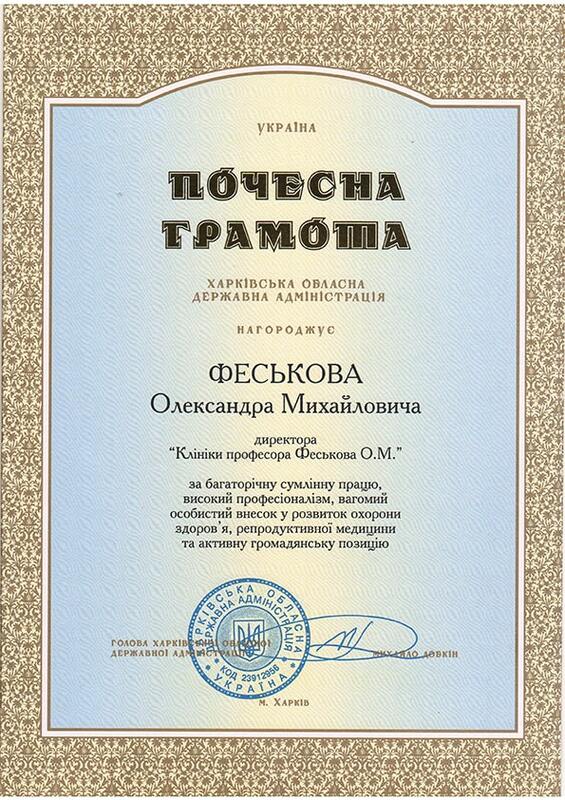 Laureate Diploma of Regional quality contest “The best product of Kharkiv region” awarded to limited liability company “Sana-Med” in nomination of works or services that are performed in domestic or industrial spheres Medical treatment, Assisted Reproductive Technologies.